I'm pretty sure this is a crisp. The oats differentiate it from a crumble which usually just has flour, butter and sugar. I am positive it's not a cobbler, which would be topped with a leavened crust. 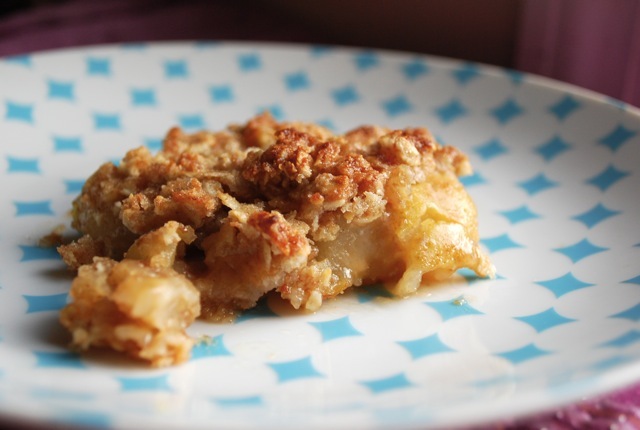 Though it's now considered a standard in American and British baking, the crumble didn't appear in a cookbook until 1924. Thank you Wikipedia. Now we know. It takes a lot of dishes to make a crisp, but it doesn't require the time or skill of a pie. A crisp can be thrown together and baked quickly, and besides that, it really does the fruit justice. Despite it's near perfect flavor the crisp, and especially the crumble, are humble and not terribly photogenic. Make this for company--crisps are as easy to consume as to make. Adjust the lemon juice according to the flavor of your fruit. More lemon for sweeter fruit and less for tart. And then less sugar for a sweeter fruit and more for a tart fruit. It can be hard to wait, but let the pan cool for at least 20 minutes (an hour is better). Because the dish is fairly sweet, serve with barely sweetened whipped cream. Preheat the oven to 350 degrees. Grease a large (13" x 9") baking dish with the leftover butter wrappers. In a large bowl, toss the fruit with the sugar, flour, zest, juice and spices. Set aside. In a mixer fitted with a paddle, or with your fingers, mix the butter and sugar, and then the oats and flour. Stir until just until the ingredients are combined, into penny-sized chunks. Pour the fruit into the dish and spread evenly. Sprinkle on the topping and bake for 50 minutes, or until the topping is browned and bubble, or crisp. Cool and serve.